Conrad C. Nowak is a trial attorney with a diverse national practice, frequently representing clients in high profile, sensitive litigation as well as transactional matters. 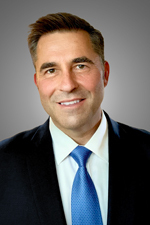 Mr. Nowak has successfully represented clients in a variety of practice areas and industries, including health care, construction, commercial litigation, labor and employment, products liability, commercial transactions, alarm and security services, catastrophic occurrences, medical malpractice, and general litigation. Mr. Nowak also has experience in white collar criminal and related civil matters, such as representing individuals in Department of Justice and other federal investigations, the Foreign Agents Registration Act, and other congressional inquiries. He is Co-Chair of the firm's Alarm & Security Services Industry Group. He has represented clients in matters pending throughout the country, including California, South Dakota, Iowa, Missouri, Alabama, Arkansas, Washington D.C. and others. Mr. Nowak joined Hinshaw & Culbertson LLP in September 2005, after completing a judicial clerkship for the Honorable William D. Maddux, Presiding Judge of the Law Division of the Circuit Court of Cook County. As part of his responsibilities, which included the preparation for review, argument and ruling on significant motions before the court, Mr. Nowak also assisted with the management of the Cook County Asbestos Litigation Docket, which maintained approximately 6,000 cases exclusively assigned to the Presiding Judge. While in law school, Mr. Nowak was selected to serve in two prestigious internship positions, one with the U.S. Attorney's Office for the Northern District of Illinois, and the other with the U.S. Equal Employment Opportunity Commission, Chicago District Office. In addition to his other law school accomplishments, Mr. Nowak was the Featured Articles Editor of Loyola University Chicago Forum of International Law and Assistant Features Editor of the Public Interest Law Reporter. He was a member of the Dean's List and was Student Representative, Loyola Business Law Advisory Board. While at DePaul University, Mr. Nowak was a starter on the Division I Men's Varsity Tennis Team. Afterwards, he also competed on the ATP Professional Tour, where he obtained a world ranking. During his undergraduate studies, Mr. Nowak was member of the Dean's List and the Phi Kappa Phi and Phi Alpha Theta fraternities. Mr. Nowak also served as a non-commissioned officer in the United States Army, beginning his service with the 13th Infantry Regiment and subsequently being assigned to the 3rd BN, MID, 12th SFG (ABN). He is the recipient of numerous awards and recognitions. He speaks Polish fluently and is familiar with Serbo-Croatian. Represented a corporate defendant in the world’s second largest property loss for the year 2001, a catastrophic fire in Iowa, with initial losses estimated at $290 million. Through aggressive discovery and motion practice, helped obtain a favorable settlement months before trial, amounting to less than the cost of defense. The remaining similarly situated defendant suffered a $40 million verdict, the largest in Iowa history. Obtained a defense verdict at trial representing a major health club in a negligence/products liability action. Plaintiff sought $15.6 million from the jury. Represent numerous security companies in catastrophic losses throughout the United States with multimillion dollar exposure. Obtained a directed finding in favor of a corporate client in a gender and religious discrimination matter before the Illinois Department of Human Rights. Obtained summary judgment in favor of numerous clients in the construction and property settings. Successfully represented national youth programs in high profile litigation, including wrongful death. Successfully represented large metropolitan board of education and transportation companies in sexual abuse cases. Serves as an instructor in The Chicago Bar Association's Trial Practice Program, instructing other lawyers in the areas of opening and closing statements, direct and cross examinations and other relevant topics. Previously served as a discussion facilitator for the Illinois Supreme Court Committee on Professionalism's new law student program at Loyola University Chicago School of Law. His presentations include "Electronic Discovery," for the National Council on Investigation & Security Services (NCISS) Annual Conference, Chicago, Illinois, April 2010. Faculty member at Hinshaw University, the firm's nationwide attorney training and education program where he teaches continuing legal education courses in local rules, practice and procedure, and a deposition workshop. Quoted or mentioned in a variety of media for both his legal and non-legal accomplishments, including Fortune Magazine, The Wall Street Journal, Chicago Lawyer, The Chicago Daily Law Bulletin and Polvision. Conrad Nowak Authors Article, Is Your Company Battle-Ready?